Here is an almost-finished new home in Waterville. The photos were taken before snow, and before the last of construction was completed. The owners, after shopping for an open lot, found a beautiful piece of property…with a house on it. Last winter/early spring they tackled the site work–removing the house and some trees and preparing the ground for construction. The house is slab-on-grade and one story. 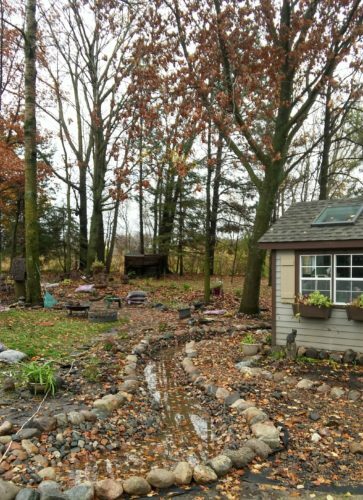 The photo above shows the creative landscaping the owners have undertaken to move water from one side of the property to the other. The little “river” runs underneath the driveway and allows rain/snowmelt to travel around a sweet potting shed. The solution created an opportunity for interesting and unexpected landscape focal points. I can’t wait to see it next summer when the plants are growing. Inside the house, the main living spaces have varied ceiling heights as can be sensed at the fireplace in the greatroom. The dining room is behind the fireplace and faces the front of the house. 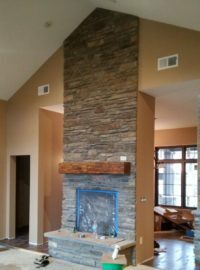 The photo below is the wall opposite the fireplace with a magnificent view to the lake. To keep the greatroom from being blinded by the sun (it faces mostly south) a roofed lanai with an outdoor fireplace lies just outside the French doors. 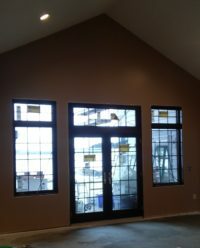 The lanai also provides an indoor/outdoor connection to the house, the yard and the lake. 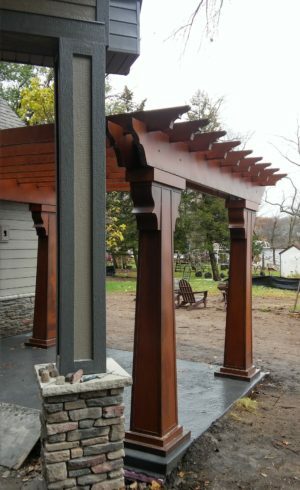 Beside the lanai, outside the master bedroom, is a patio with copper pergola. It provides a private, separate place for the owners to go outdoors in the mornings and evenings–checking on the lake, sitting quietly, and enjoying the first or last rays on the lake. Check back for some finished-project photos coming soon!